Since the first quarter of 2013, Jake Rademacher has facilitated BROTHERS AT WAR RESILIENCY WORKSHOPS for six thousand returning service members and their families. The program begins with the group watching the award winning documentary feature film, BROTHERS AT WAR, in which Jake Rademacher risks everything – including his life, to tell the story of his two Soldier brothers serving in Iraq and Afghanistan. In addition to providing an up close and personal view of our Soldiers at war, the film is a deeply personal view of a family divided, but ultimately profoundly bonded by the crucible of war. 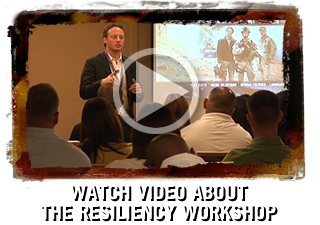 The BROTHERS AT WAR RESILIENCY PROGRAM integrates multimedia, journaling, live instruction and group participation to create discoveries, break down barriers between family members, and invigorate the reintegration process for Service Members and their families. The workshop gives Soldiers and their families new insights and strategies, which can be integrated into their daily lives. Surveys of these groups have a favorability rating of 4.8 out of a possible 5.0 for the film, the instructor, and the process. Click here to contact a BROTHERS AT WAR representative to set up a BROTHERS AT WAR RESILIENCY WORKSHOP for your unit. Below is an overview of the Workshop and a list or our Clients. The Intro involves the audience in the event at the very beginning as they realize that the film they are about to watch is about a military family like theirs. For family members, the film offers a window into what their loved ones have gone through overseas. Watching the film together becomes a conversation and emotional icebreaker. Immediately after the multimedia presentation, a BROTHERS AT WAR Certified Facilitator gives a brief tutorial on journaling technique, and then instructs the participants to write a response to the first question. The cathartic process of writing down thoughts and experiences paves the way to personal insights and insights into their loved ones. After journaling, the facilitator asks individual participants to volunteer their answers. This initiates a robust exchange and sharing of experiences. The culmination of the discussion builds cohesion within the group, as the participants examine the impact of deployments, separations, and reintegration. The next journaling session focuses on inappropriate questions and comparisons. This is followed by an examination of the vast difference in experiences of those who have deployed and their families vs. the society into which they are reintegrating. The facilitator will then have the Service and Family Members watch a series of DVD extras – with each vignette followed by its own journaling and discussion session. This session focuses on positive experiences overseas, death of comrades, the expectation vs. the reality of homecoming, and setting goals for the future. Leadership within the unit can go one step further, by having a Leadership Follow-on. Company or Platoon Leadership utilizes the journals that were filled out within the workshop to stimulate further discussion. Not only does this set a good example, but the conversation can be tailored to meet the specific needs of the Service Members and Families under their command. In addition, opportunities for their Service Members to receive further help can be highlighted. The participants receive everything that is included in the BROTHERS AT WAR INDIVIDUAL APPROACH to inspire further journaling, family communication, and to be able to host screenings for other family members, friends, and co-workers. The Individual Approach offers continuing opportunities for introspection and revelation. It encourages a skill participants can use for the rest of their lives, and documents an incredibly significant life experience. BROTHERS AT WAR RESILIENCY WORKSHOPS have been successfully integrated into many military programs. Leaders have utilized the workbooks in follow-on sessions as a way to jumpstart important discussions about mental health, family, and resiliency. The program has successfully lowered the stigma associated with receiving further help when needed, and has often led to an increase in the utilization of counseling services offered. Currently integrated into the Army Reserve’s Yellow Ribbon Program serving Reservists and their Families from a seven-state region reintegrating 60 days after deployment. 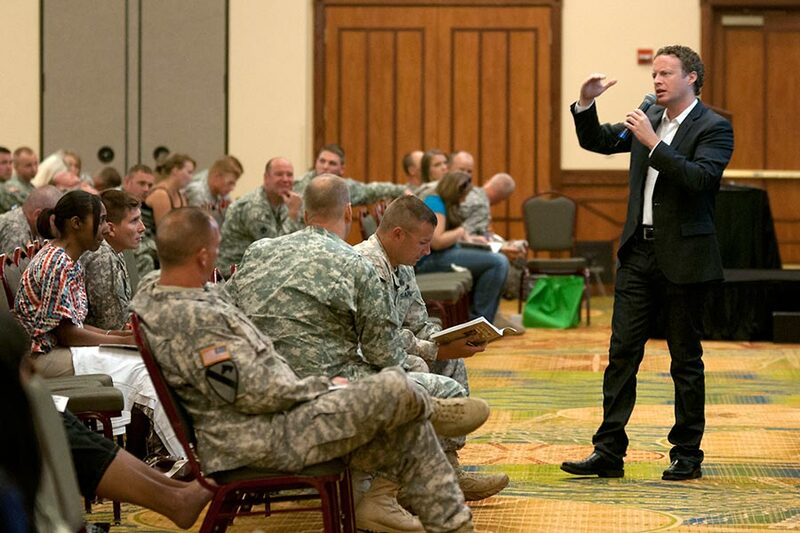 Jake Rademacher conducted multiple workshops during Yellow Ribbon Weekends for all 3500 Service Members and their Families 60 days after their deployments. Warrior Resiliency Conference evening program, subject of DCoE Study, and the Rademacher Family sat on panel discussion during the general session. Over 2000 Service and Family Members participated in workshops at FT Riley, FT Hood, FT Campbell, FT Bliss and FT Carson sponsored by Gary Sinise and TriWest. Naval Combat and Operational Stress Control Conference screening of BROTHERS AT WAR and Q&A with Jake Rademacher, and one-hour interactive session with the DVD Extras utilized in Resiliency Workshops. BROTHERS AT WAR is a registered government contractor.